In business we are in constant communication, but the way we communicate is preventing us from really connecting. As a result, we’re missing opportunities to convert. Why then, marketing executives Ethan Beute and Stephen Pacinelli ask in “Rehumanize Your Business” (Wiley, April 2019), would we trust our communication—foundational to our professional success and personal satisfaction—to indistinguishable blocks of text? These missed opportunities, Beute and Pacinelli make clear, result from our failure to personalize our messages. Not specific to sales or marketing or any single business function, what we lose to “cold” text communication is indeed our very humanness. Relationship investment is best achieved when people are face to face, but Beute and Pacinelli do propose a worthy substitute. When added to emails, text, or social messages, personal video offers psychological proximity when physical proximity is impossible. Simple and asynchronous yet authentic and interactive, video accelerates success and offers the people who matter most to any business a better experience. According to “Rehumanize Your Business”, if you teach, train, sell, or serve and want to build better relationships, all you need to do is press the record button. Yet the authors appreciate the psychological nuances and practical obstacles to adding video to existing channels. Accordingly, the first part of the book is dedicated to the humanizing nature of communication and the reasons our current tools are falling short. Millennia of human experience supports face-to-face interaction, so if sending an unrehearsed, unpolished video seems too spontaneous or casual, take it as a sign that you’re succeeding at delivering yourself, in person, at scale. Part II relates the experiences of those people and companies who have committed to adding meaning and value to their communication with video. 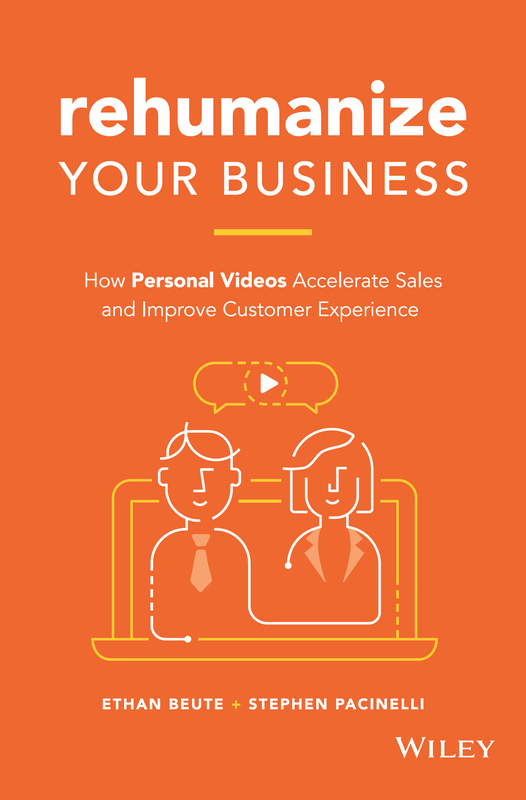 Successes outlined include improved sales prospecting, faster conversion, and an increased referral rate, and are complemented with examples of communication instances that could and should be augmented with video—and occasions when video shouldn’t be used. In the book’s penultimate part, the practical aspects of incorporating video into an existing communication framework are explored. From the various methods of inserting video into email, text, and social messages to the technological considerations regarding recording and delivery and receipt, these chapters focus on the “how” of using video. Equal attention is paid to psychological barriers, and actionable ways to get comfortable on screen are provided. This section closes out with an equipment guide dedicated to the salesperson. Part IV highlights what should come after a video is sent, and makes a compelling case for why videos may not be achieving the desired results—and what to do about it. The current state of the movement makes a strong case for the value of video resting not in technology; if Beute and Pacinelli impart just one message, it is that the value of video lies in us. Specific, measurable tips and techniques are provided, but “Rehumanize Your Business” is ultimately a blueprint for abandoning the status quo and reclaiming ourselves.